Anybody who has ever been in Austin, TX during the SXSW festival knows that it can get a little nuts. Ok – a lot of nuts. People either pile into the city, or they flee away in a hurry before it begins. That said, Whole Woman’s Health wants to make sure that people will be doing whatever-it-is-that-they-may-be-doing-(you-really-don’t-have-to-tell-us-about-it)… safely. 2.) However, it’s most effective within the first 24 hours, so it’s best not to wait. 4.) Plan B cannot be administered to those 17 or younger without a parent or guardian. 5.) Plan B is available at most major pharmacies, but be wary of which one you choose! 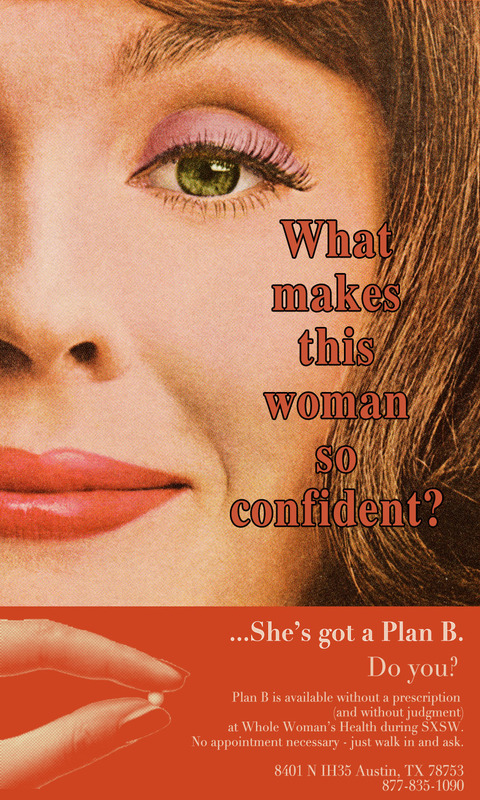 Some pharmacists as well as pharmacy techs have historically denied women access to Plan B. Why? We don’t know. A lot of them say it’s because of their moral obligation to not dispense the stuff. Which either means a.) they think Plan B = The Abortion Pill (again, no it doesn’t.) or b.) they just think you’d make a really great mother. In any case, heading to a pro-choice women’s health clinic is the best bet for a no-hassle, no-judgment purchase of Plan B. Have any questions? Just ask! Otherwise, we’ll see you during SXSW! Whole Woman’s Health: Seeking 1 Pro-Choice Marketing Intern!